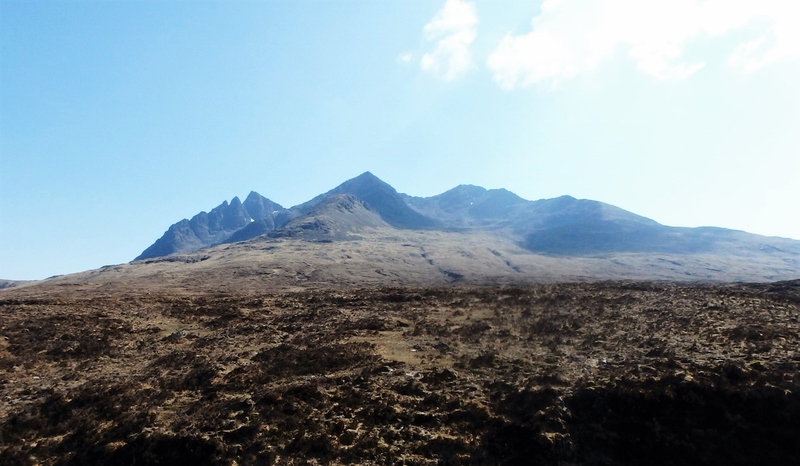 Skye weather can be fickle and the midges ferocious, but a visit in May is often blessed with settled weather and no biting insects. 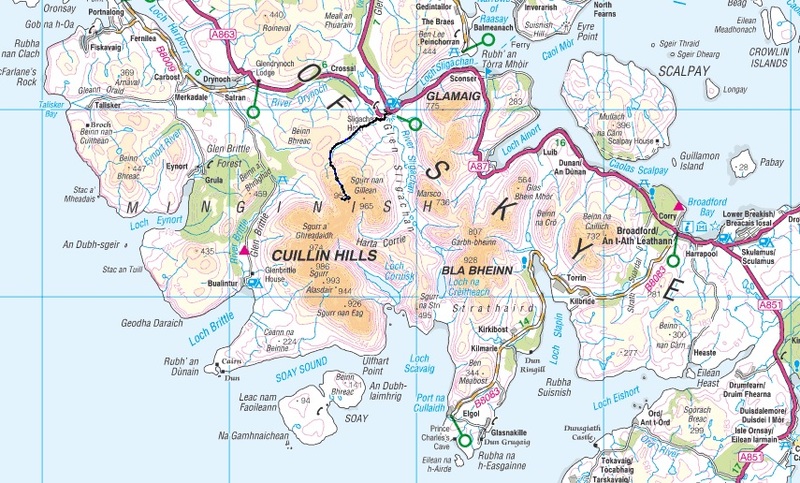 Chris and I had a couple of enjoyable walks out to bothies on our Skye trip (see post #223) but a day on the higher mountains was tempting. 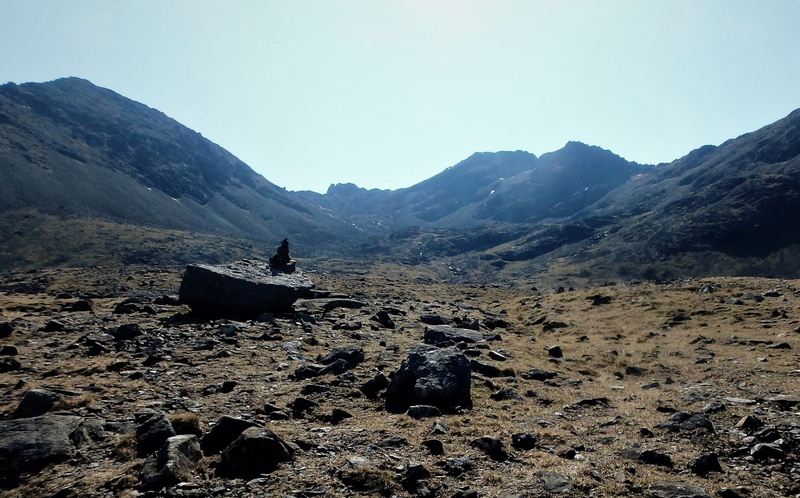 Chris had no great desire to head for the Cuillin Ridge, so it was going to be a solo trip – with Border Collie ‘Mist’ of course. 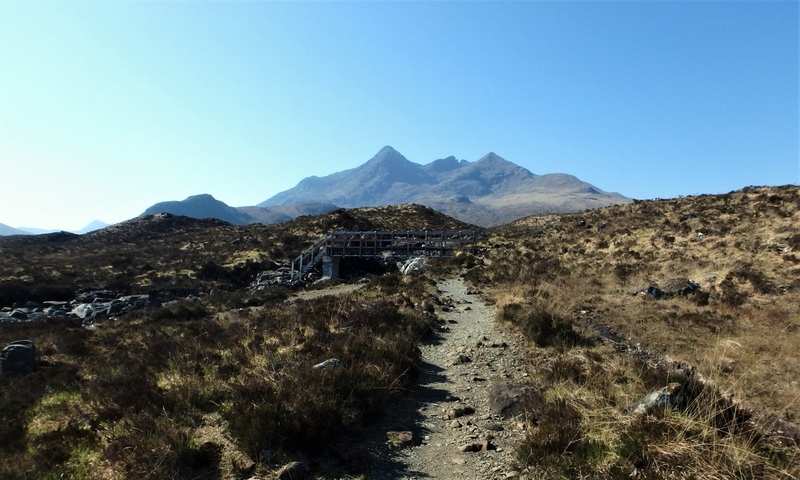 We were at the campsite at Sligachan, so something at the northern end of the Cuillins looked favourite. 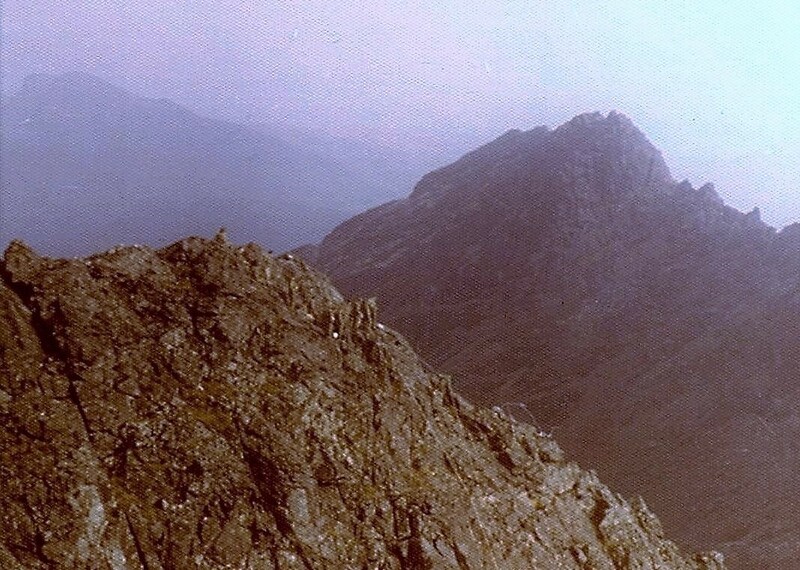 Although I have never done the whole Cuillin Ridge in one trip, I’ve collected most of the summits over the years. 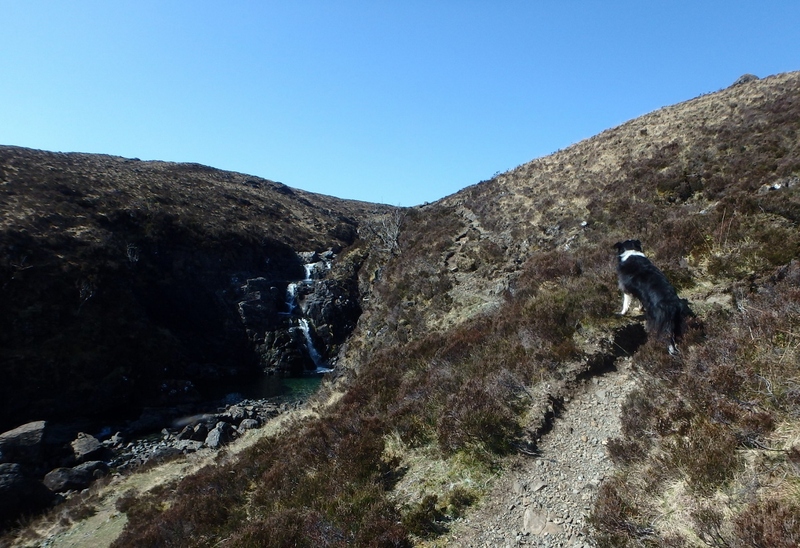 However, one omission on my ‘tick list’ was Bruach na Frithe, which makes an interesting but non-technical day out, an important consideration when taking a dog along. So, Bruach na Frithe it was. 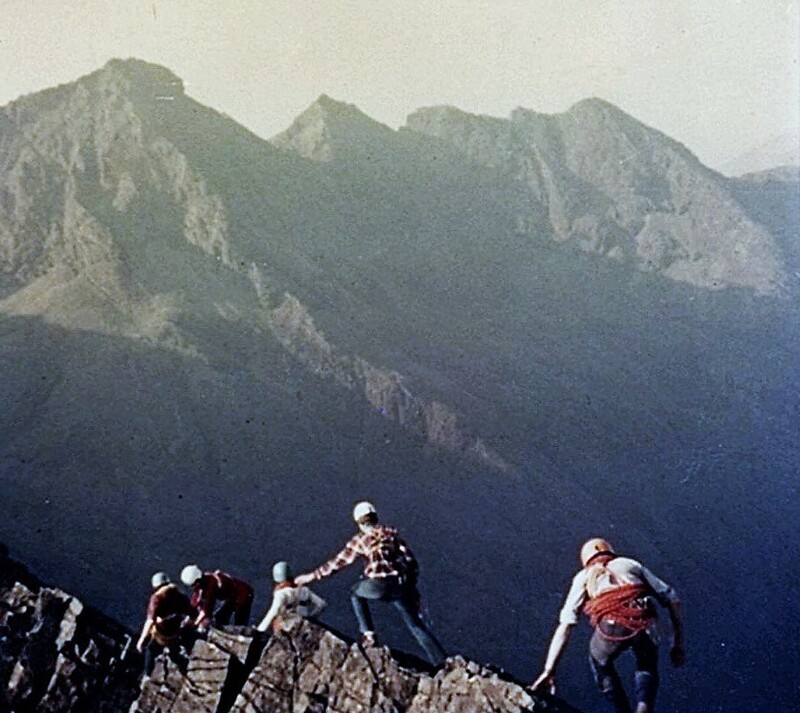 My first visit to the Cuillins was in 1970, but the ‘Misty Isle’ was well named that year, and we didn’t get any serious hill days, and 1971 was only marginally better. 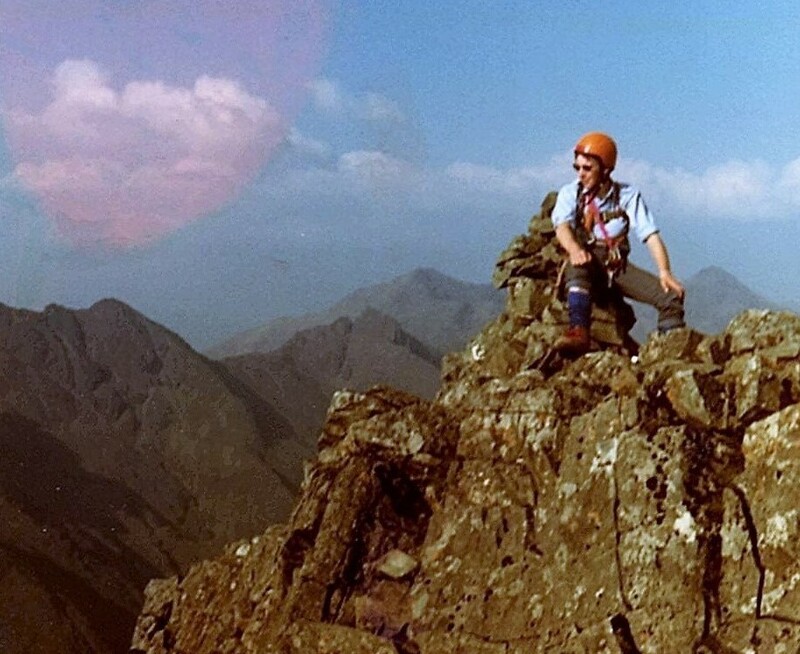 Then in 1972 we hit the jackpot with the weather and I had my first trip out on to the main Cuillin Ridge. We started on a 1000 ft (305 metres) rock climb on Sgurr Mhic Choinnich for no other reason than it was one of the longest in the guidebook. 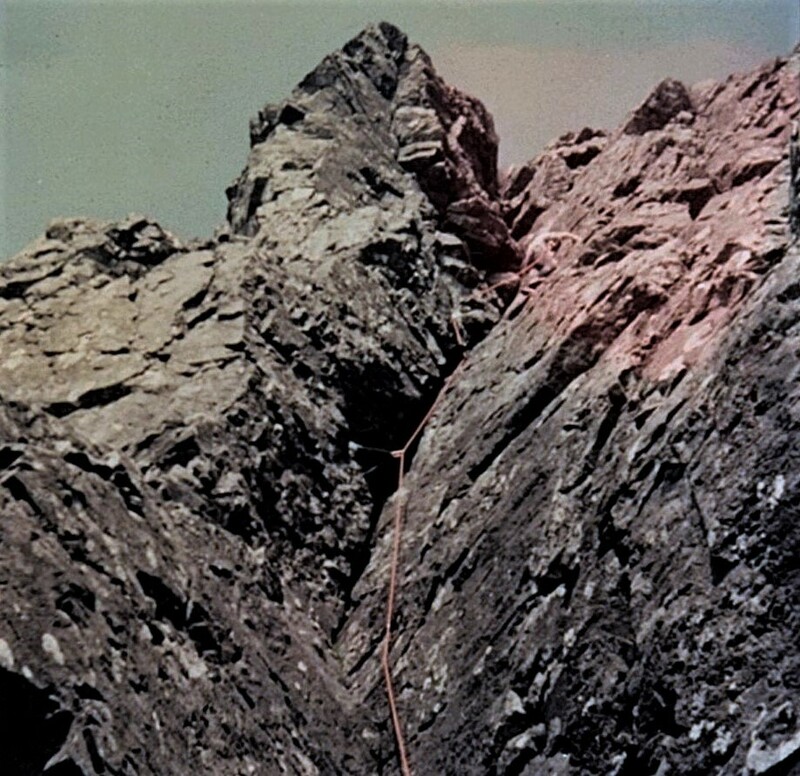 1973 was almost as good, but by then we had learned to go for quality rock routes rather than just quantity – as with many things, size really isn’t everything! Then, in 1974, I joined the Royal Marines. 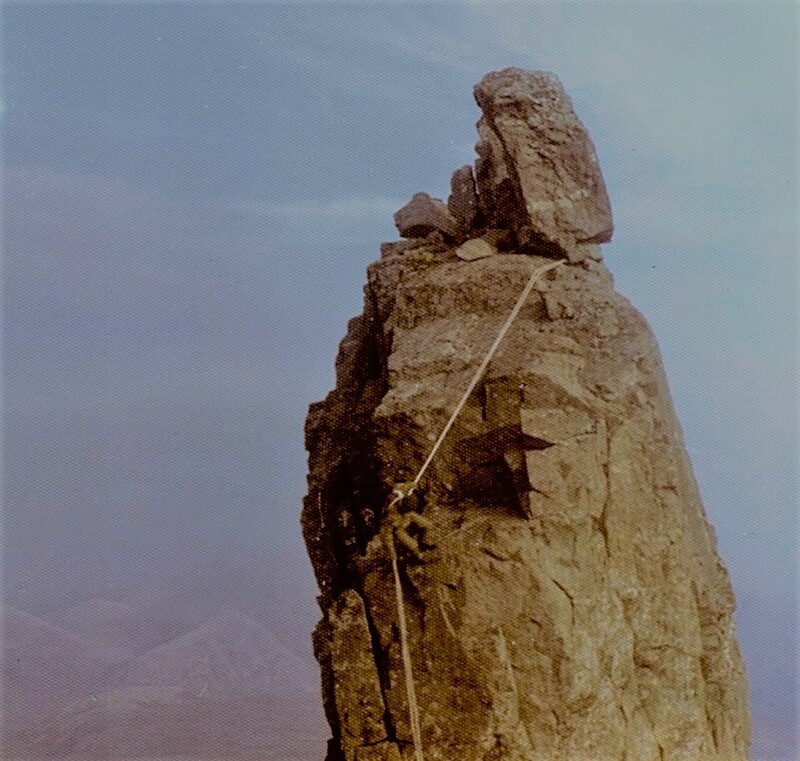 My recruit troop completed the RM Commando Course just before the training centre went on annual leave – most of my mates went home for a lazy two weeks holiday, but I headed back to Skye for another climbing trip. My first unit after training was 45 Commando, based in Arbroath. In my first year, I did a tour of duty in Northern Ireland, learned to ski (the military way! ), completed Arctic Warfare training in Norway and took part in Mountain Training back in Scotland. Then, 12 months after joining the unit I was back at the Commando Training Centre, this time on an officer training course; when I completed the course I asked to go back to 45 Commando, the only unit I ever wanted to be in. My first posting as a junior officer was as Troop Commander of 8 Troop, Z Company. 45 Cdo was regarded as THE Mountain and Arctic unit at the time, and my Company Commander, Dougie Keelan, was a keen mountain man himself. 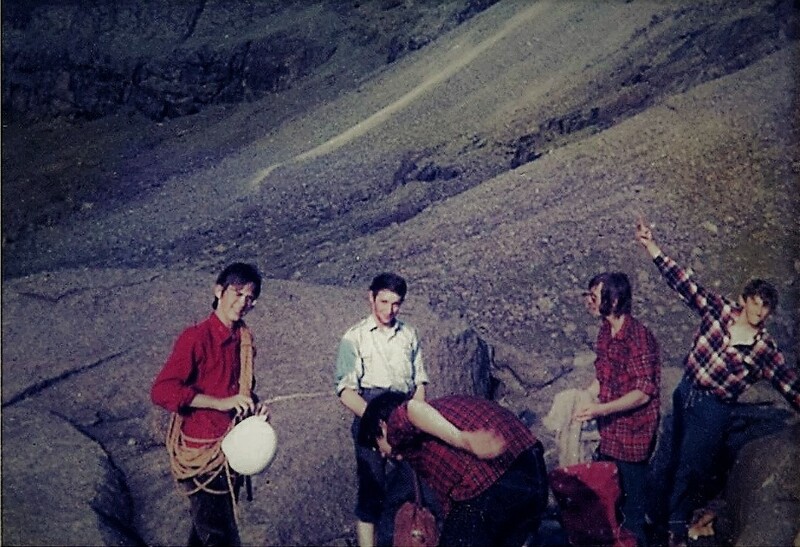 In 1976 the unit went to Skye for mountain training and I couldn’t believe my good fortune – there I was, playing on the best mountain range in the UK and getting paid to do it! 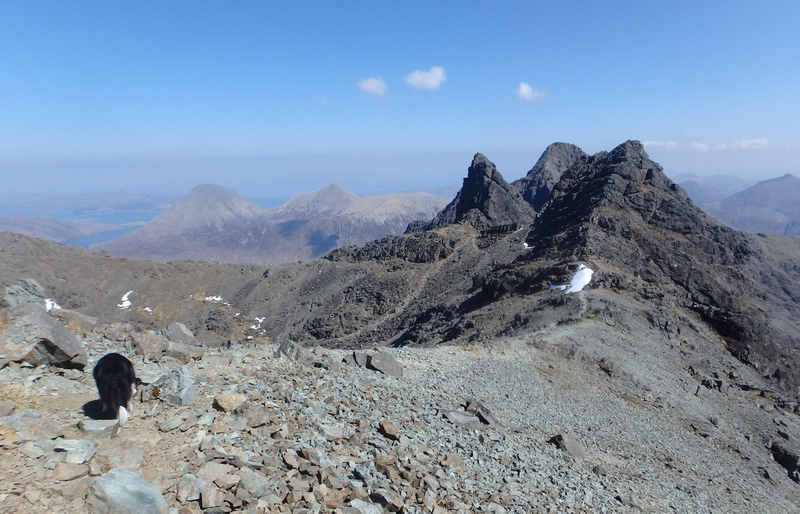 During the time we were there, the Company ticked off most of the Cuillin Ridge – But not Bruach na Frithe! 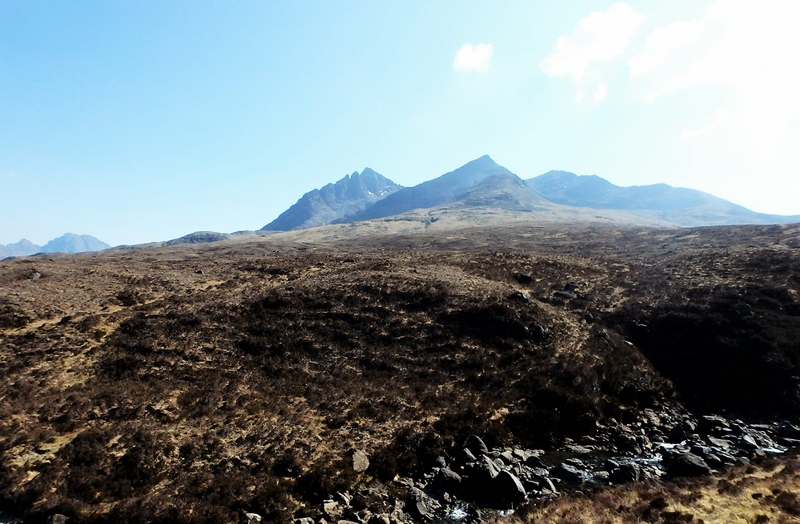 Setting out from Sligachan …. 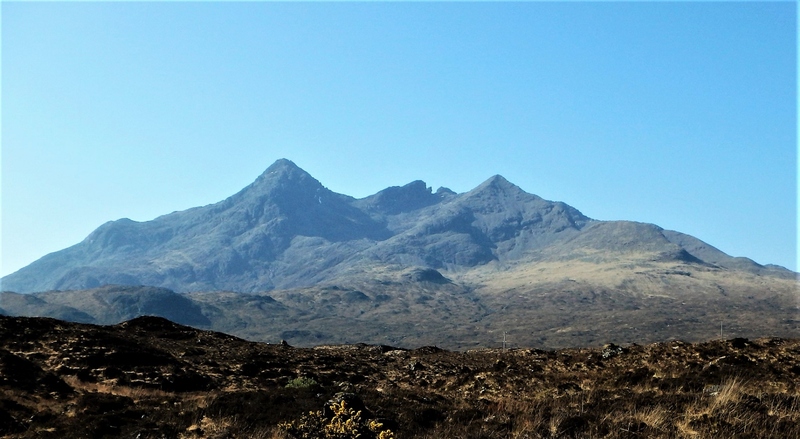 The campsite at Sligachan has one of the best views of the northern Cuillins, with Sgurr nan Gillean, Am Basteir and Sgurr a Bhasteir dominating the view. Setting off from the campsite with ‘Mist’, my objective, Bruach na Frithe, was just round the corner in the corrie of Fionn Choire, and hidden from view from the campsite. 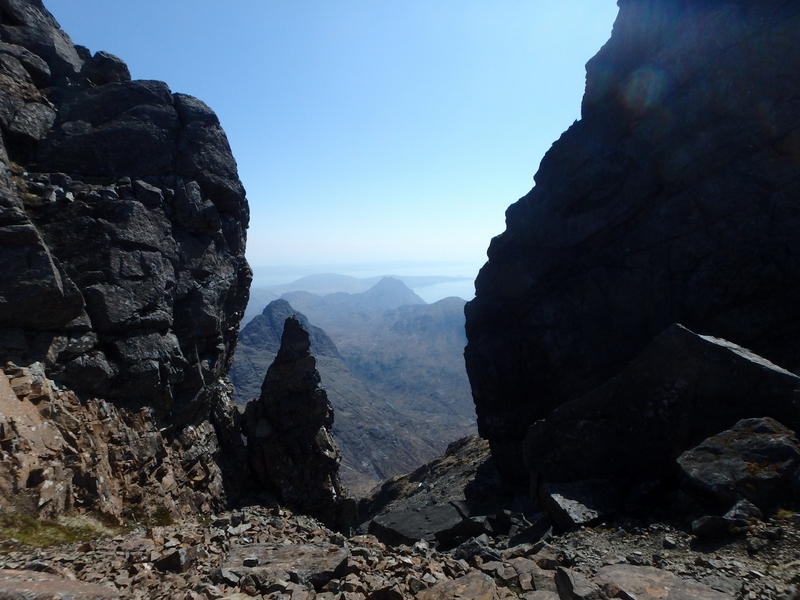 The west side of Pinnacle Ridge on Sgurr nan Gillean coming into view …. A steady walk in alongside the waterfalls and pools of the Allt Dearg Mor soon brought a different view of Sgurr nan Gillean. 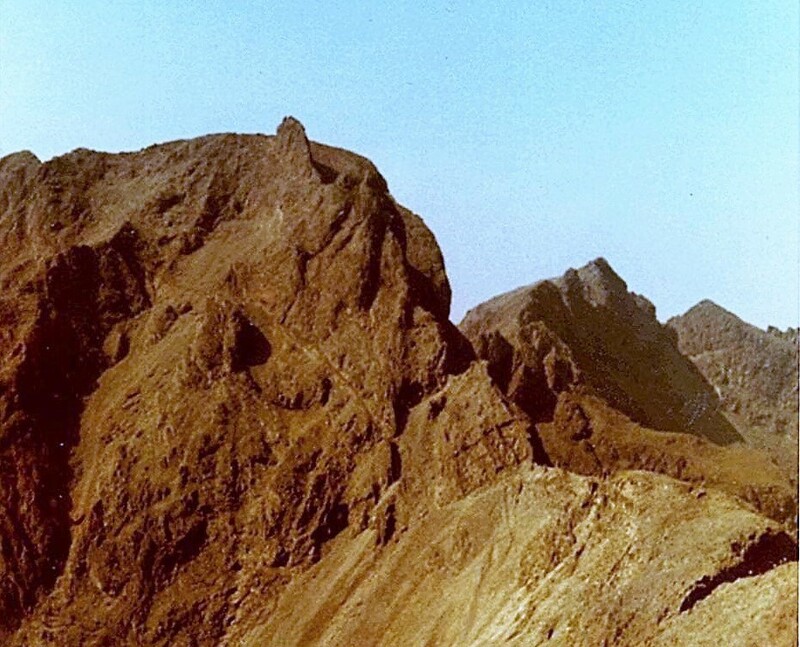 The panorama of the west side of Sgurr nan Gillean from the Allt Dearg Mor is a classic view, and the saw-tooth edge of Pinnacle Ridge is unmistakable – it’s a cracking mountain route and I had climbed it in the summer of 1976, while on leave with a couple of mates who were also marines. 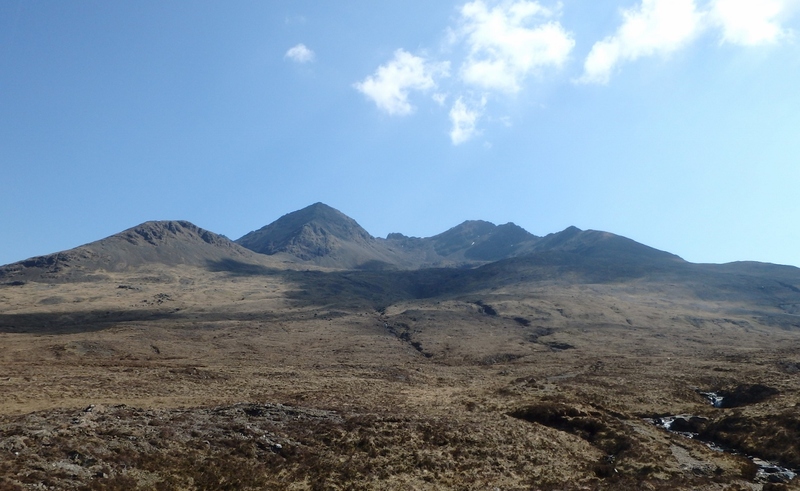 Then, as I made further progress along the Glen Brittle path, I started to get a better view into Fionn Choire. The last of the grass …. 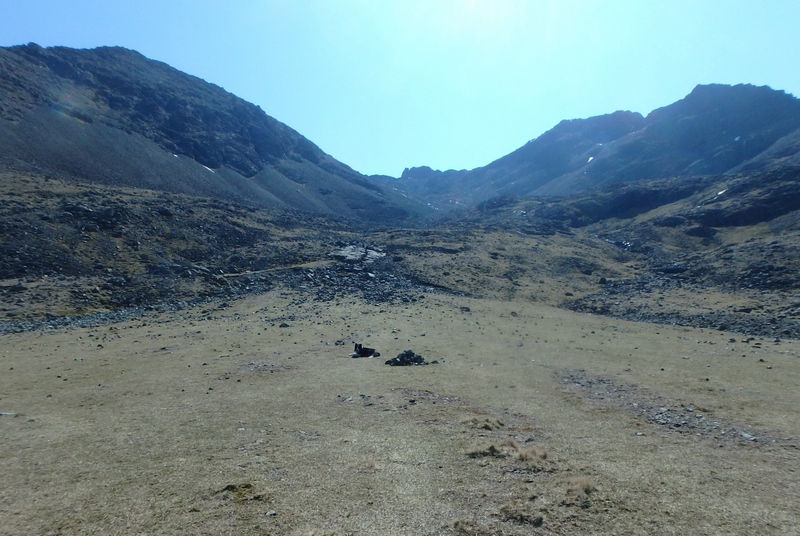 There was still quite a bit of moorland to cross, with a steady height gain. Once into the rocks of the corrie things changed, and before long it was time for a brew of coffee and a ‘sarnie’. Coming down the slope was an old guy who must have been in his mid-70’s – I had passed his tent on the way up. He’d been up early for a wander around the Ridge, and was heading down for a kip. I remember thinking that I hope I’m still doing that sort of thing when I’m his age! 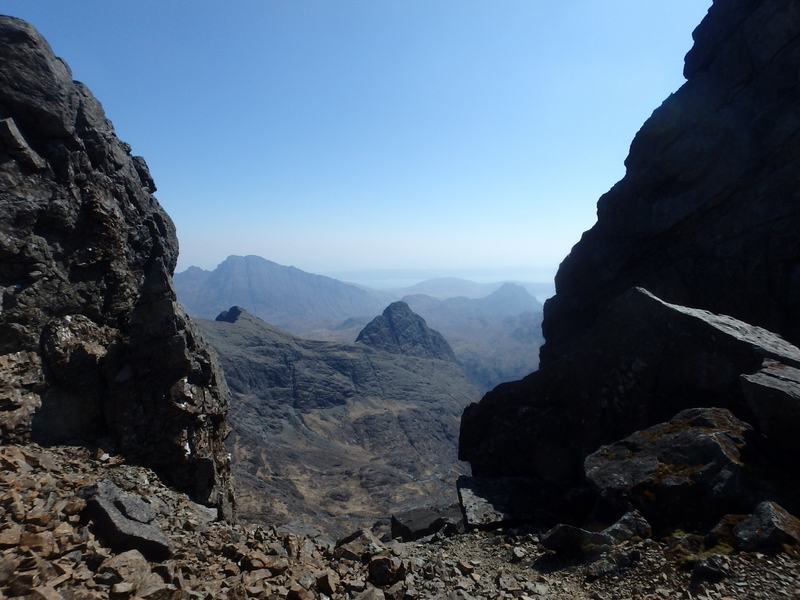 Views from Bealach nan Lice – looking towards Blabheinn (Blaven) …. 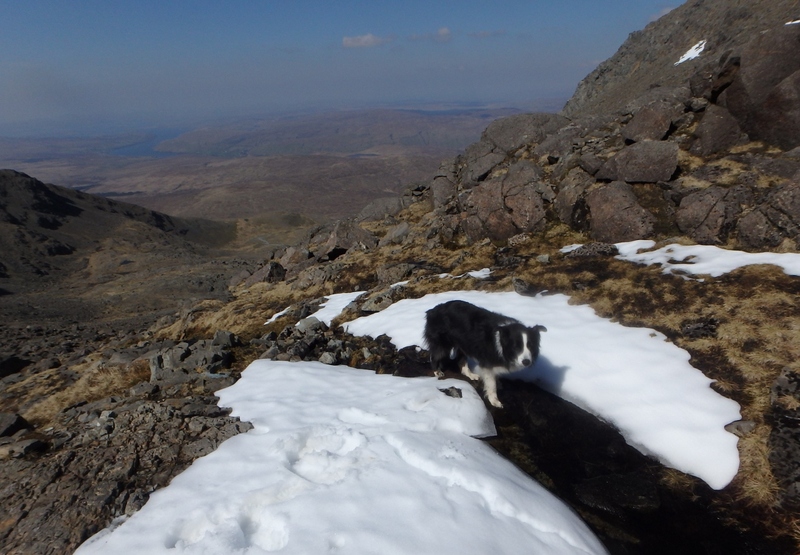 Nearly on the East Ridge of Bruach na Frithe …. 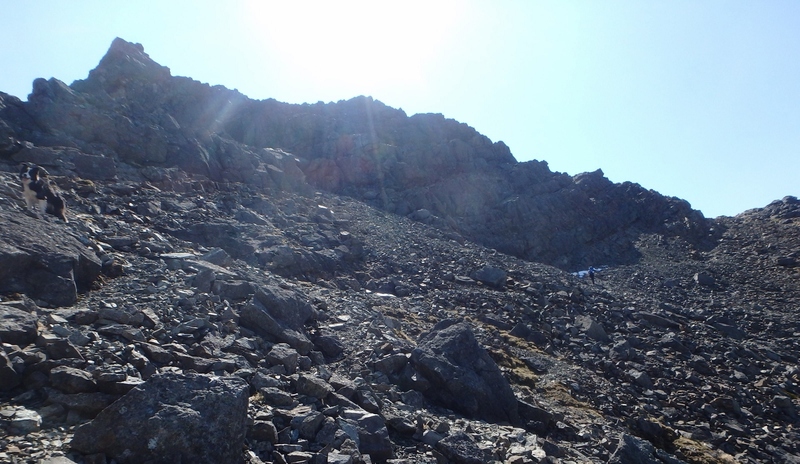 The plan was to head up the left side of the corrie to Bealach nan Lice, then to traverse underneath the peak of Sgurr a Fionn Choire to hit the East Ridge of Bruach na Frithe. At the bealach (pass) there were great views across Lota Corrie towards Blaven, and across Harta Corrie towards Elgol, where we had witnessed a superb sunset a few days back (see post #223). 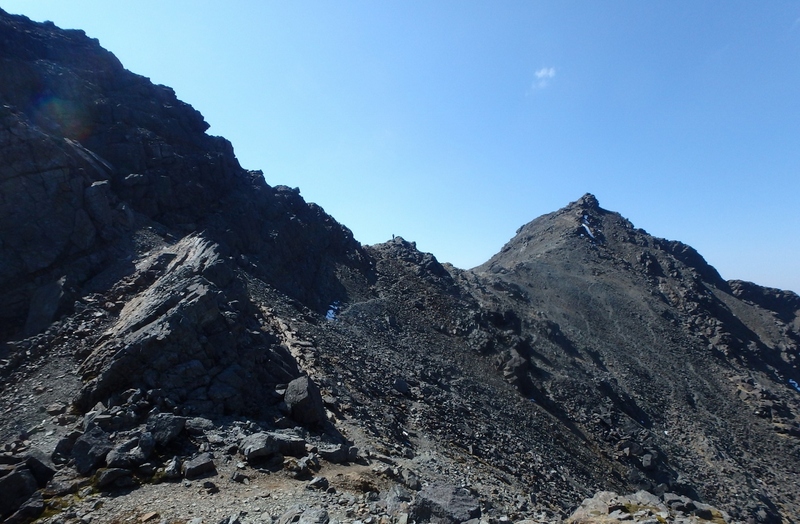 The East Ridge seemed longer than the map suggested, but that thought disappeared as the Cuillin Ridge came into view. 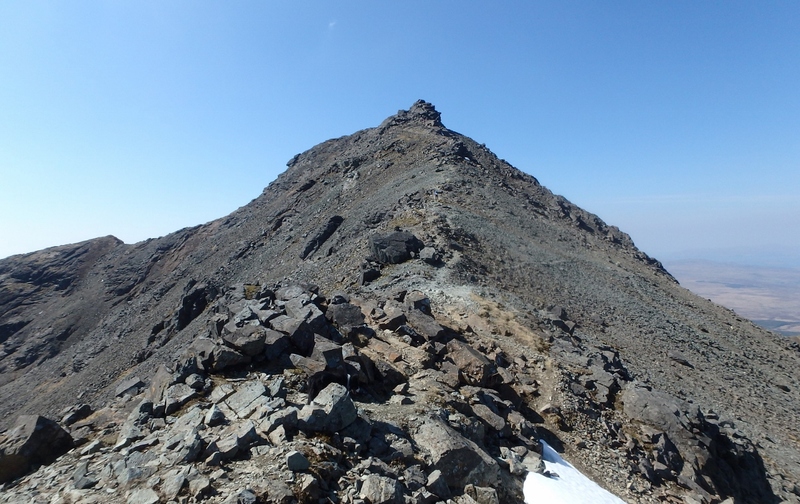 The easy ridge to the summit …. 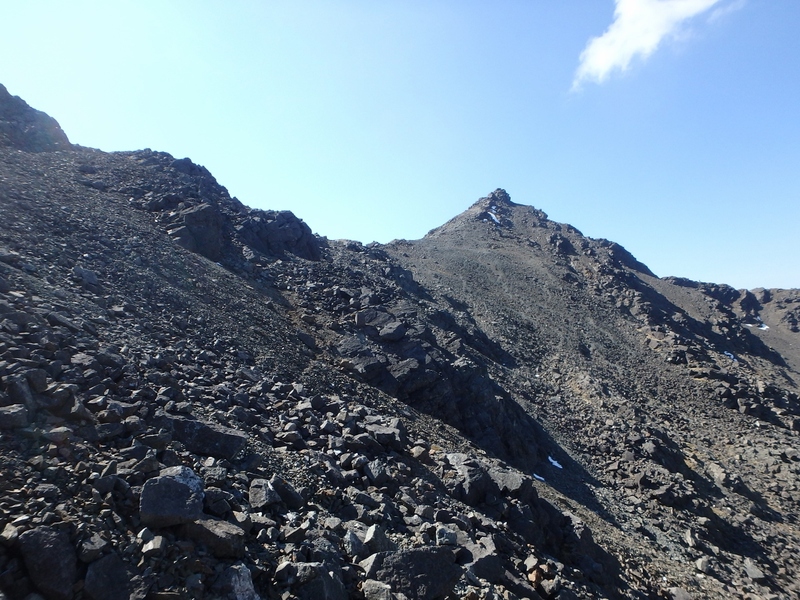 The view of the ridge from the summit of Bruach na Frithe is something else – it’s also virtually impossible to do it justice in a photograph, so the curious reader will have to go and take a look in person. 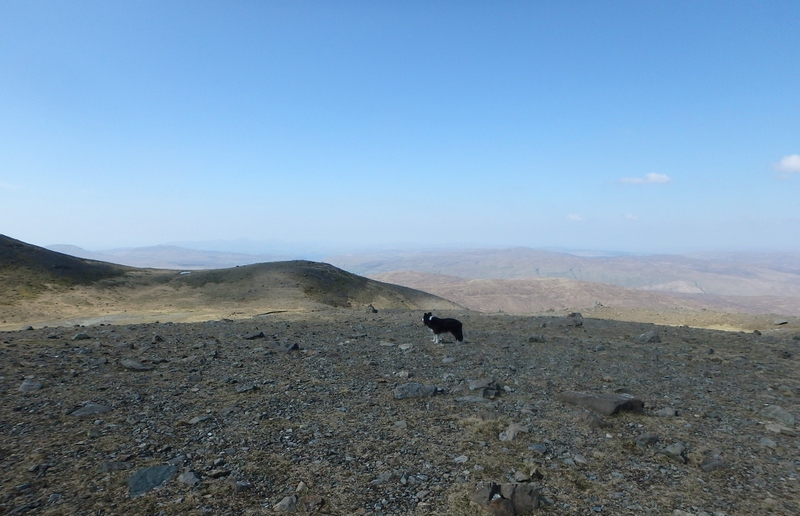 I had decided on a return by the same route – the Northwest Ridge looked like a ‘goer’, but I didn’t fancy an ‘epic’ with the dog if I came across an awkward bit. Reversing a route isn’t such a big deal anyway – the views are always different for one thing, and this option didn’t disappoint. 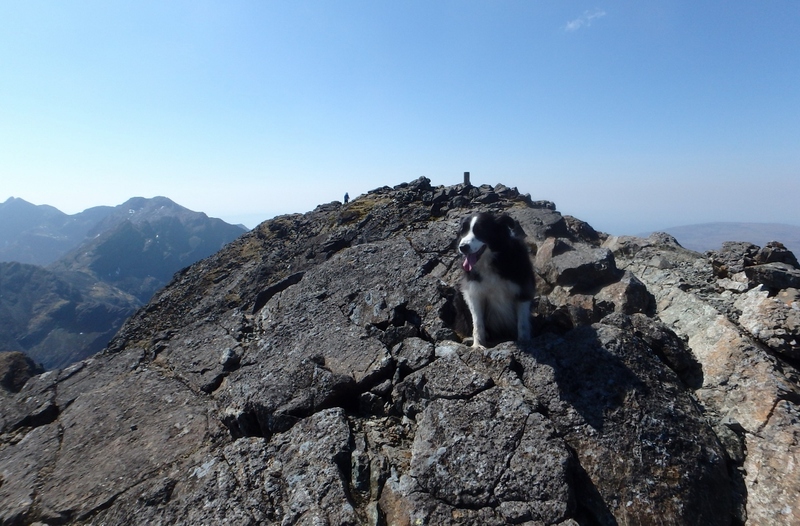 I was also a bit wary of having the dog on gabbro rock for too long – ‘Mist’ is a real mountain dog, and her pads are quite hard, but gabbro is possibly the most abrasive rock you can come across, and it shreds boots and clothing in quick time. I made my way down, shouting a quick ‘hello’ to the old guy in his tent. ‘Mist’ had a drink in just about every pool on the descent, but I was happy to wait until we were back at Sligachan campsite for an ice-cold cider out of the fridge – after all, we are supposed to ‘re-cidrate’ aren’t we? This entry was posted in 1. Scotland and tagged Border Collie, Commandos, Cuillins, hillwalking, mountaineering, mountains, photography, Royal Marines, Scottish Highlands, Skye. Bookmark the permalink. This is a great blog, Paul. I have a border collie named Trixie in Italy and I miss her so much since I moved to the UK in 2009. We used to go walking together too -not as much as you and Mist though!- and I was getting a little emotional looking at your pics…. thank you for sharing and happy walking!! Chris and I are hoping to be in the Dolomites in August – if the trip comes off we will have Mist with us as well. Hope your trip goes ahead. I am sure you and Mist will love it! Thanks for that Fabio – it seems we have several things in common, including Border Collies! 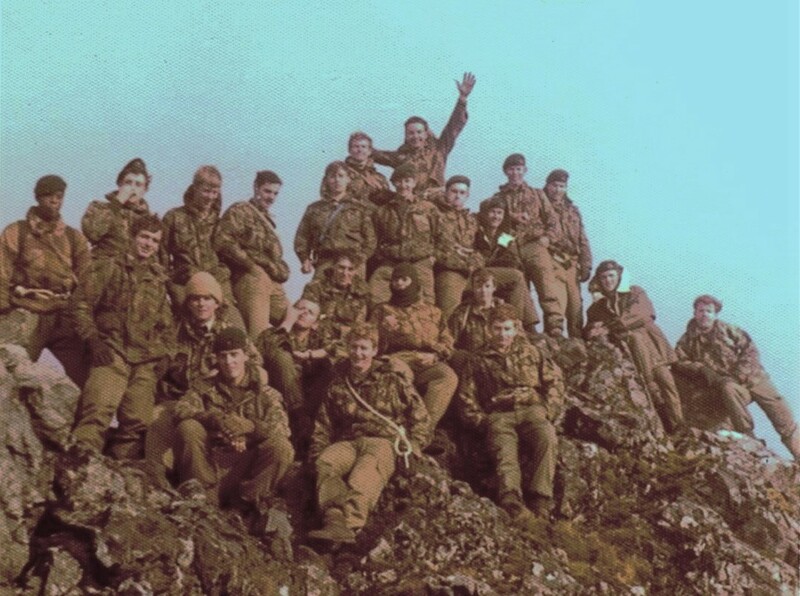 My RM Commando unit trained with the Italian Alpini troops on Skye in 1976, and they were a great bunch! It was amazing watching them dismantling howitzers and winching them up cliffs! Our unit was a mountain unit but we were Arctic troops rather than Alpine and the Royal Marines still train in Arctic Norway every winter. I have visited Valle d’Aosta a couple of times, mainly for the skiing – it’s a lovely place! Hello Paul!! How are you, Chris and Mist doing? Have you been to Italy in August? Its time for me to start walking again! I have been away for too long from my mountains and from my passion of photography… so after a long time I am back on.. trail! I did some trail running too but that is becoming a little less appealing as I tend to concentrate on the run and not so much on the surroundings… so I guess walking like I used to do is the right answer! Do you mind if I ask you some advice? First I would like to check whether I am allowed to wild camp for one night -or two- in Brecon Beacon National Park? 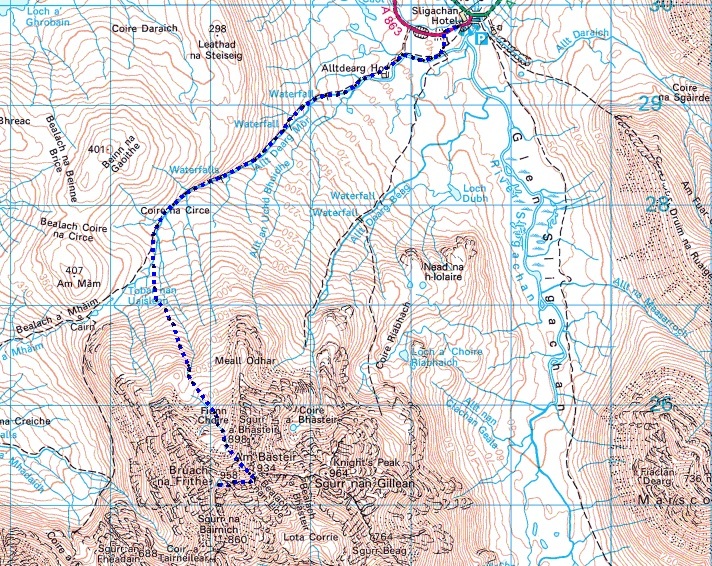 It is the nearest to me and I have read that I can camp near Ystradfellte if thats right… ? Lastly, I still look forward to welcoming a Border Collie in my life but I will have to settle first: too many things to sort out… and I am not sure what my ultimate home will be… maybe Wales! Early days.. Anyway hope all is well with you all. Look forward to hearing from you. Hi Fabio, I hope all is well with you. Wild camping in the UK is a bit complicated! Strictly speaking, wild camping is not legal in England and Wales, but many people do it and it is usually tolerated if you follow some simple and obvious rules. Perhaps the most obvious is to try to be discreet – if you pick a site high in the hills, away from farms and other people, you will probably not be noticed so no problem. Stay away from houses and farmland, arrive late and leave early, and don’t stay in a place for more than one night. The most obvious rule is leave no trace that you have been there – remove all waste and don’t light fires. On the whole, wild camping is tolerated more than some other European countries, so don’t be put off! One good piece of advice is to ask permission whenever possible, that way no one can complain, but as I said it isn’t really a problem to wild camp if you are considerate – thousands of people wild camp with no problems at all. I’m not a club person either, but here are a couple of pointers – The Ramblers Association has a bit of a reputation for being ‘old’ in attitude – I’m sure there will be many younger people in some of the clubs, but they are regarded as being ‘old-fashioned’ in outlook. The Long Distance Walkers Association would probably suit you better – you would even get some good tips on wild camping, as a lot of LDWA members do multi-day backpacking trips. Sorry to hear you have not been to Italy. But hey, next year Italy should still be there.. hopefully! During my research, I have come across the two associations you have mentioned and maybe I will give it a go at some stage. What I do not like about groups though is the lack of freedom…. I want to go out to feel free and maybe I would find it hard to comply with the rules that joining groups inevitably brings about. Thank you very much for mentioning those to me anyway. In regards to wild camping, from your words it appears to be a matter of ‘common sense’. If you love nature, you want to respect it too. My aim is to be an observer of nature leaving the minimum possible trace. There is so much to learn and to admire. I find nature even overwhelming at times: I do not know where to look… it is all so magical! What does it for me is photography. The camera forces me to focus on that particular frame. Only that and nothing else. No problems. No bills to pay. No nothing! I am new to wild camping. Apart from the experiences early on in life, as a boy scout and in the army later on. What I like about solitude is that it allows me to completely immerse in the surroundings. I am looking at wild camping as a mean of enhancing this. I have come across studies of non verbal communication some time ago, as I was given some training as a salesperson. I find it fascinating. Isn’t interesting how animals, particularly dogs can communicate with us in such an effective way without needing to talk! I will let you know how I get on… once again, thank you for the tips!